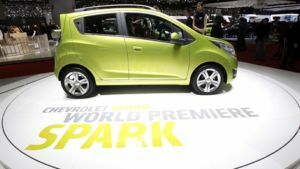 Starting in 2013, car enthusiasts can look forward to a Chevrolet mini-car running completely on electricity, as the Detroit-based car manufacturer is planning to launch Spark EV. The new model, which will become a new addition to the electric vehicle fleet of General Motors, will be offered in limited numbers in certain markets in the US such as California, as well as abroad, said Chevrolet. Additional information on quantities and specific markets as well as on pricing will be announced in a later date, said General Motors. According to Jim Federico, global vehicle chief engineer for EVs at Chevrolet, Spark EV will complement the 2013 Malibu Eco with eAssist (a new gas-electric hybrid technology that can improve a vehicle’s fuel economy) and the Volt extended-range EV. Battery packs for the new model will come from battery manufacturer A123 Systems Inc.